Slimline vertical mount coin cell battery for 20mm batteries such as the common CR2032. Size is about 1" wide x 0.93" tall x 0.3" deep (excluding leads). Features 2 PC pins for hookup on 01.15" centers and 2 stabilizing tabs. Stabilizing tabs are on 0.600" (15.24mm) centers and designed to be snapped into 0.136" diameter, PCB holes. Fits batteries BR2012,CR2012,BR2016, CR2016, DL2016, BR2020, CL2020, BR2025, CR2025, DL2025, BR2032, CR2032, DL2032, ANSI 5000LC, IEC CR2016 . 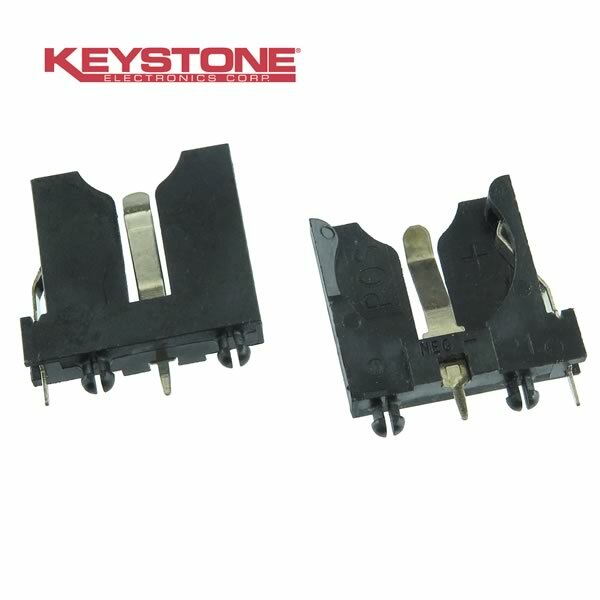 Keystone Part# 1065.